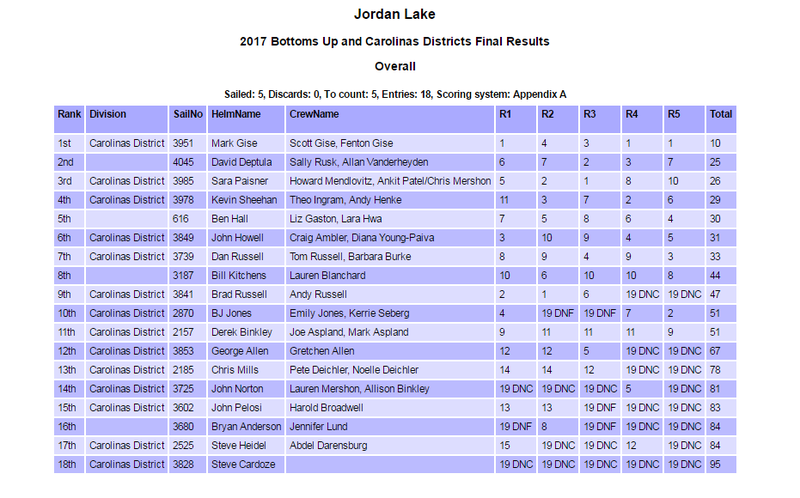 Welcome to the 2019 Bottom's Up Regatta and Carolinas' Thistle Districts! Fleet 155 and the Carolina Sailing Club are excited to continue the Carolinas' tradition of the Bottoms Up Regatta. We invite all sailors to campaign their Thistles at this long standing regatta, which has been a bedrock of the southeast spring championship series. We look forward to seeing you here so we can sail and socialize with fellow Thistle sailors on the waters of Jordan Lake in central North Carolina. The Carolina Sailing Club, while a vibrant and active sailing club, does not have a formal club house location. For regional regattas, our members open up their homes to serve as a club house, and to house visiting sailors. For this weekend, the club house is designated as the home of Sara Paisner and Howard Mendlovitz. This weekend's club house is approximately a 20 minute drive from the sailing venue. The sailing area for the weekend, Vista Point on Jordan Lake, is open 0800 – 2000 for those who want to set up or drop off boats. Boats can be left mast-up overnight in the designated trailer parking area. Boats will be left mast-up overnight in the designated trailer parking area. Dinner will be after racing on Saturday at the clubhouse, home of Howard Mendlovitz and Sara Paisner. Directions will be provided at registration. All boats must be removed from Vista Point by 2000 when gates close. Early Registration: Please register early to help us with our planning. You can register using the links below. Note that registration will increase by $15 after April 20th. All skippers 25 years or younger are exempt from registration fees. These skippers are encouraged to pre-register, and will be reimbursed on-site if they register by April 20th and start at least one race. Camping: Camping is available at the clubhouse (Sara and Howard's home). Please indicate if you plan to camp on the Additional Info and Housing Signup Sheet. Housing: Limited housing is available at the clubhouse and at additional local fleet members' homes. Please let us know on the Additional Info and Housing Signup Sheet if you would like housing. Meals: Dinner on Saturday night is $6/person, children under 12 are free. Please purchase your dinners below. Dinner will be a traditional NC pig pickin' with fixin's. Vegetarian options will be available. Two of our club's Flying Scot fleet members will be working all day cooking the pig while we sail. Breakfast on Sunday will be provided at the clubhouse and other fleet members' homes. Babysitting: Please let us know if you need assistance with arranging babysitting by noting it on the Additional Info and Housing Signup Sheet. If you have any questions about the event, please contact our fleet captain, Sara Paisner, via email or phone. Please register below. We look forward to hosting you and seeing you on Jordan Lake! Please (1) provide details about sail numbers, crew names, contact information and if you need housing by clicking the REGISTER link below then (2) PAY FOR REGISTRATION & DINNERS using buttons below. Thank you! Please select this registration if you are a US Sailing Member. This price is valid until April 20th, 2017, after which prices will go up by $15. Please select this registration if you are a not a US Sailing Member. This price is valid until April 20th, 2016, after which prices will go up by $15.